During the summer months, wildfires rage through parts of Canada, invariably destroying large swaths of land and rural communities. While there is not much you can do if your home is caught in the centre of a wildfire, you can take measures to protect your home. Invest in fire-resistant Class A rated roofing materials to ensure that your roof will not catch fire. Use tempered glass when installing windows; regular kinds of glass can easily crack under intense heat. Keep your lawn and surrounding areas free of flammable material and make sure your firewood is kept far from your home. Reduce the density of trees around your home and plant new trees sparsely, to slow the advance of a potential wildfire. Make sure to have fire extinguishers around the house, and be sure your family understands how to use them. Maintain your smoke alarms regularly: check batteries frequently and replace them as needed. Prepare an escape plan and make sure every member of your family knows it by heart. 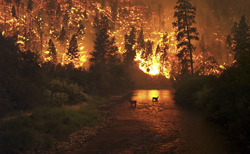 Keep in mind that in the event of a wildfire, follow the instructions of emergency personnel. If it is deemed to be in your best interest to leave your premises altogether, it is a wise idea to take their advice seriously.